this is a first for us — the most ragtag outdoor movie experience of the summer in d.c. is coming on the 3rd friday of the month this summer in june, july, and august. we’re partnering with the ivy city civic association to produce a neighborhood movie night — a true community partnership from spark to screen. 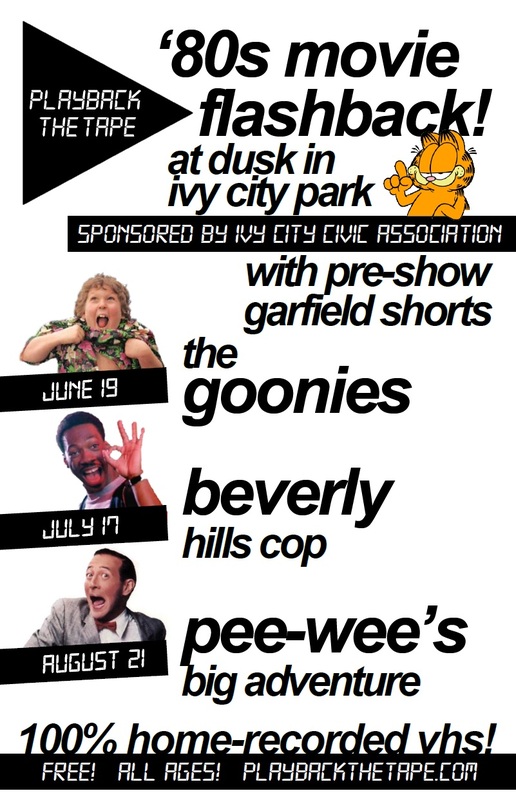 join us on 3 select evenings at dusk for feature-length ’80s movies (screening from original, home-recorded vhs) with pre-show “garfield” cartoon specials. you’ll discover displaced youth on june 19th, displaced detective on july 17th, and a displaced bike on august 21st. bring friends, neighbors, and blankets to catch these favorites under the stars in ivy city. Posted on July 13, 2015, in Entertainment and tagged Ivy City, Movies. Bookmark the permalink. 1 Comment.